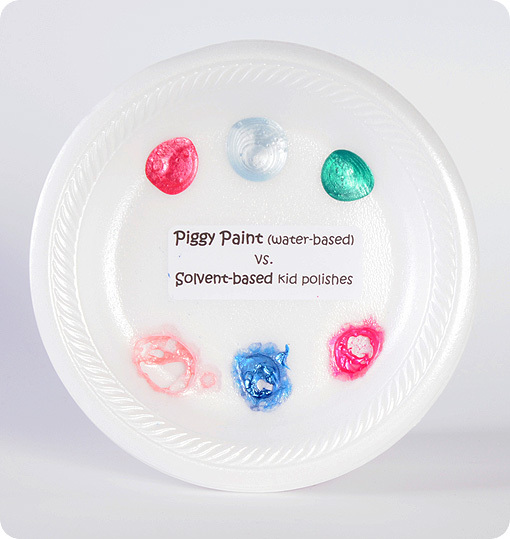 Piggy Paint – The Safe, Natural Way to Pretty Up Those Piggies! For the last few weeks, my daughter Riley has been all about playing "This Little Piggy Went to Market" with her toes. Since she was having us pay all of this extra attention to her little piggies, I thought that she'd really enjoy having me paint her toenails as well. Now, she's only 17 months old, so I didn't want to use just any nail polish. It had to dry really fast (because you know toddlers can't stay still for very long) and I wanted it to be non-toxic, just in case she decided to put those little painted piggies in her mouth! 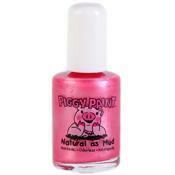 Fortunately, there is such a product out there and its name is Piggy Paint. The nail polishes are typically $8.99 each and the nail polish remover is $8.99 as well. Piggy Paint does have some different gift set options available too. Apply 2 -3 thin coats of Piggy Paint™. After about a minute and a half, I let her down to play again. She was walking on our beige carpet, which I was expecting to be speckled with pink at any minute, but it wasn't! Piggy Paint really did dry in 60 seconds! Riley began grabbing her toes to inspect what I had done and the nail polish didn't get all over her either! SUCCESS! This was a very fun thing to do with her and it turned out perfectly! 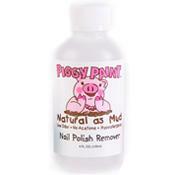 Pretty piggies and no mess or tears! The nail polish also dried to a hard finish and didn't chip either, so her little toes still looked beautiful even after hours of playing in her bare feet. It really did DRY IN 60 SECONDS! WEAKNESSES: I don't really feel that there are any weaknesses with this product except possibly the price of $8.99 per bottle. Many folks might think that price is a little high for a bottle of nail polish. I do believe though that in the end it will be worth it since we are sure to have many hours of fun painting each others' nails safely. Disclosure: I received the bottle of nail polish remover and Forever Fancy nail polish from Piggy Paint in order to facilitate my review. No other compensation was received. This product review is based on my own personal experiences with this item and is completely honest and objective.